Random Noodling: Poetry Friday--It's All About the Frogs! 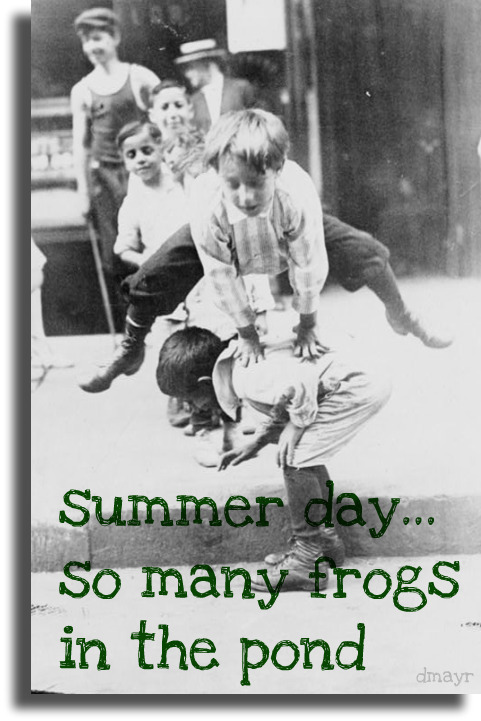 Poetry Friday--It's All About the Frogs! 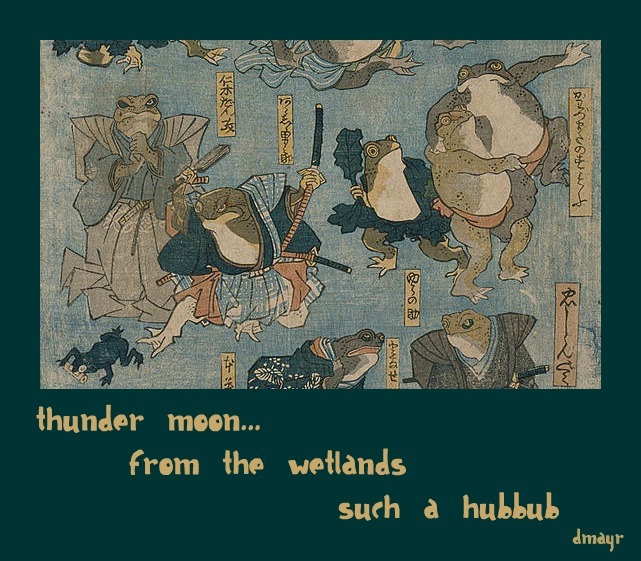 So far this spring/summer, I've posted two haiga that had to do with frogs, although last Sunday's was indirectly related to frogs. Since my Happy Haiga Day! posts don't get a lot of readers, I'll repost those two, as well as three older frog haiga. All haiga © Diane Mayr, all rights reserved. The last one you may have seen before since I quite like it! It is from the time when I used to submit to online journals that took haiga. Oddly enough, it was rejected with an explanation that led me to say, "Really, that's the best you can come up with?" The reason, I was told, is because the font was too big and not acceptable for haiga! Ha! This first Friday in July you'll find Tabatha rounding up the poetry links at The Opposite of Indifference. Have a safe holiday weekend! I'm sure it was that particular editor's preferences. If I were a haiga editor I'd probably reject any submission where I thought the font was too small. That's what make submitting one's work such a crap shoot. Hi, Diane. The pun in your first poem made me laugh. "Thunder moon" is such a wonderful phrase -- pairing it with the noisy word "hubbub," I loved that! Coincidentally, today is the first day of July, which is the month of the Thunder Moon! I love your apology to Basho! Nice. I love a good pun, Bridget! Enjoyed all of these, Diane!! An army indeed! Do you know Hoberman's great poem, "Frog". No, I'll have to look for it! I love the photo and the joy of a simple game! These are all wonderful, Diane--it's a good challenge to keep working with the same/similar images, isn't it? I think my favorite is "thunder moon"--most intriguing combination of illustration and type layouts. The Japanese prints are great, aren't they! That last one...just love it! I am in awe of the way you create with words and art, Diane. I enjoy putting them together, Tara! I'm glad you like it, font and all! Love all of these, but I think the 'army' one is my favourite. The collective name for frogs is something I only learned recently--just in time for this frog collection. Fun poems! First time I heard of a haiga though (had to look it up). 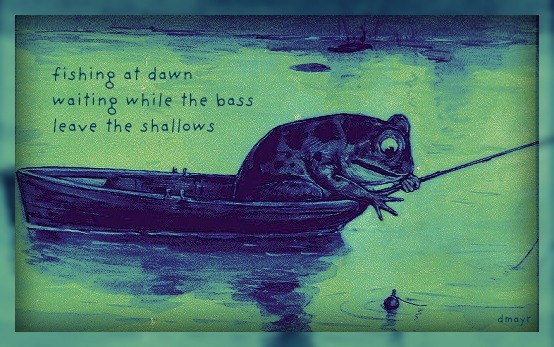 :) My favorite is the frog fishing. 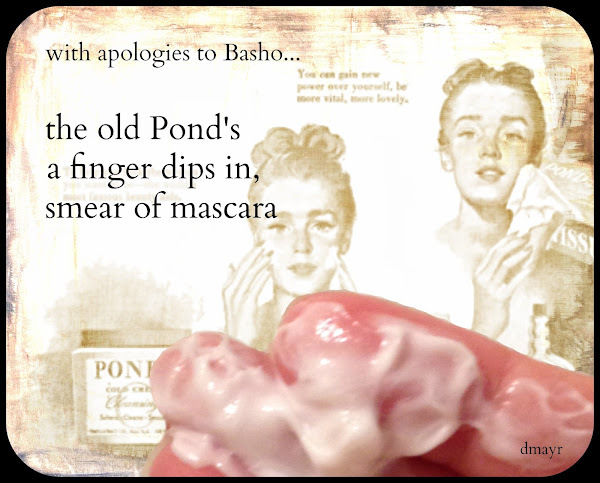 I create a lot of haiga, so if you come back you're bound to see plenty! I follow your words, and love each, Diane. The pictures add, too, of course. I enjoyed all those frog characters in 'thunder moon' especially. Don't you love the Sumo wrestlers? Love the playful "Ponds" reference - and I'm intrigued by that retreating bass. Thanks for sharing all of these! 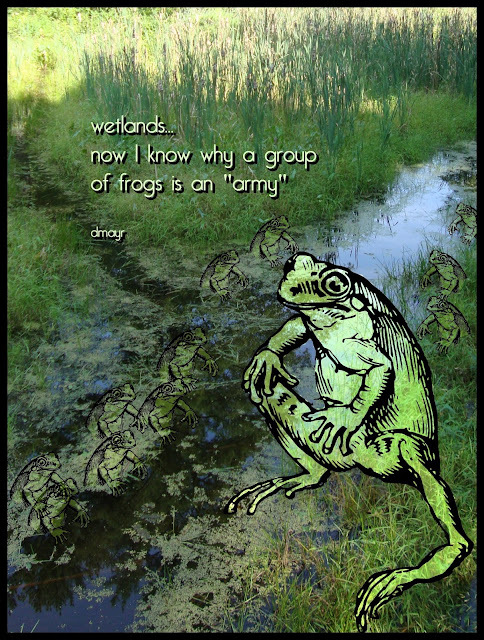 We still have quite the loud froggy-toady chorus from the flooded dip in terrain behind our house, after some hard rains lately. Happy July!